71 years ago today, the Imperial Japanese Navy launched waves of small propeller driven aircraft from ships in the middle of the Pacific Ocean. These aircraft swept down across the hills of Oahu and executed one of the most devastating surprise attacks in modern history. Somewhat prophetically, Isoruko Yamamoto is quoted as saying “I fear all we have done is awaken a sleeping giant and fill him with a terrible resolve”. Photograph taken from a Japanese plane during the torpedo attack on ships moored on both sides of Ford Island shortly after the beginning of the Pearl Harbor attack. View looks about east, with the supply depot, submarine base and fuel tank farm in the right center distance. 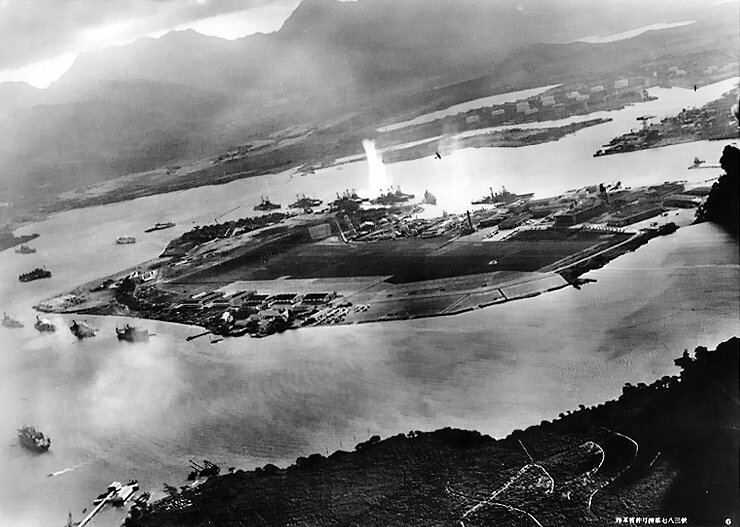 Japanese planes are visible in the right center (over Ford Island) and over the Navy Yard at right. U.S. Navy planes on the seaplane ramp are on fire. Today we remember that attack, and the terrible toll that resulted as American forces engaged in a bloody and brutal campaign in the Pacific. I am of the opinion that US forces would have been engaged in Europe in all cases but, that fighting concurrently in both the European and Pacific theaters was not a forgone conclusion until Dec. 7th. Take the time to reflect on this day in history, and remember those that stepped into the breech both in the theaters of operation, as well as those that ramped up and served the industry of our nation to provide the material necessary to support the war fighters. Wow. Getting mentioned in the same post as Lex. Thanks Thor, you do me great (perhaps undeserved) honor. My first visit here. I will be back. Good stuff!